The multi-talented Chula Vista-born artist’s debut EP, LuvHz, is out on April 26. Look up Jackie Mendoza online and you’ll likely be hit with words like “ukulele” and “bedroom” and “YouTube,” none of which even begin to capture the oddness of the Chula Vista-born songwriter-producer’s lanced, frenzied, electronic post-pop. Her debut EP, LuvHz, due out on April 26 and produced by Rusty Santos (Animal Collective, Panda Bear), is in turns luxurious and corrosive, jumping between English and Spanish, thrums and distortions. Lead single “Seahorse” was on the lusher side of that divide with its liquid beats and twinkling compressions, but “Mucho Más,” premiering below, is more jagged. Mendoza sings it in Spanish, and her vocal melody swirls away from the barely recognizable reggaeton beats, whistles, and industrial clashes at her back. 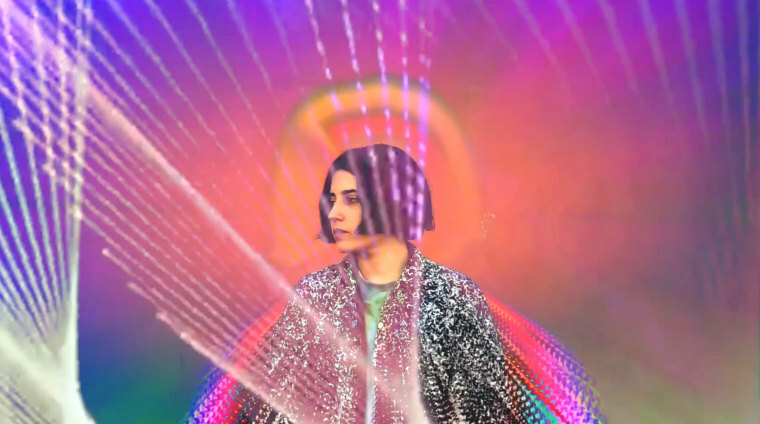 Watch the psychedelic, Glitchybb-directed video for “Mucho Más” below. LuvHz is out via Luminelle Recordings on April 26.